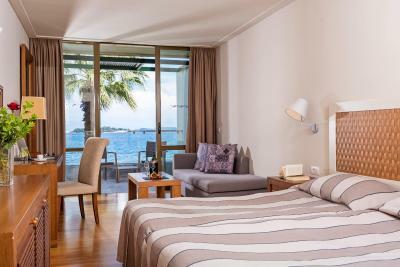 Lock in a great price for Kontokali Bay Resort & Spa – rated 8.8 by recent guests! The beach is excellent, very comfortable and with cslm and clear water. Great place for swimming. The food was also very good. Hotel is easily accessible from the airport (£25). The ride takes 15 minutes. We got complementary bottle of wine, bottle of water and minutes massage which was a nice touch. Room was big, clean with specious balcony. Hotel offers tv with international channels which is quite handy. There are beautiful views of sea from the restaurant and bar. Swimming pool is a true feature especially at night. 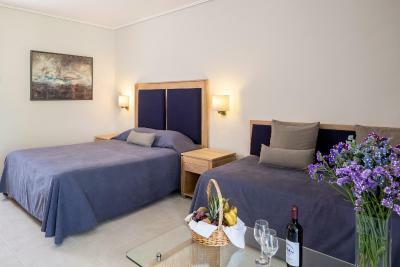 Hotel offers quite a lot starting with free of charge beach chairs, tennis court, ping pong table and volleyball on the beach, and indoor swimming pool with sauna, Jacuzzi, water jets and gym. 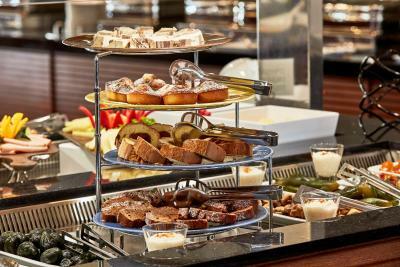 Breakfasts and dinner ware fantastic with a lot of choice. 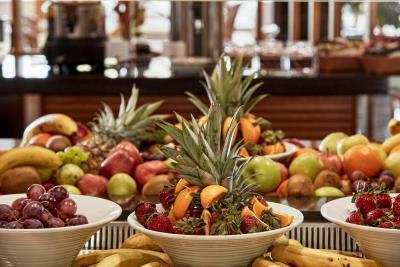 Only minor thing - hotel could improve on variety of fresh frut. The facilities, staff, breakfast and entertainment at night were outstanding. The 25 m salt water swimming pool and enormous jacuzzi in the spa were beyond expectation! The location and the property is simply fabulous. The building is so tasteful and beautiful. The pool is in credible. It's sparkles at night with little lights and is a beautiful infinity pool during the day. The restaurants are delicious. The beach and the easy access to it is the winner here. Spa was fantastic. 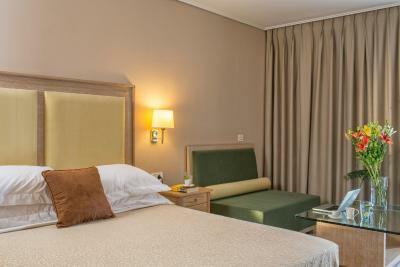 Nice room and professional friendly staff. Very helpful staff, outstanding breakfast, beautiful sandy beach with service. Probably the most pleasant hotel I've ever visited. Kontokali Bay Resort & Spa This rating is a reflection of how the property compares to the industry standard when it comes to price, facilities and services available. It's based on a self-evaluation by the property. Use this rating to help choose your stay! Located in the green-covered Kontokali peninsula, the green-key awarded Kontokali Bay Resort & Spa features its own private beach and a sea-water pool. 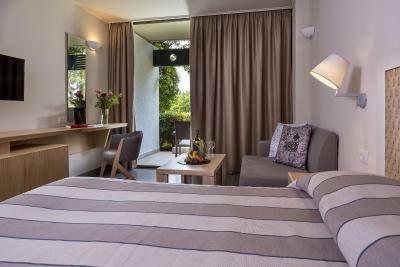 It features a floodlit tennis court, 4 restaurants and rooms with free WiFi. The property features 261 rooms and suites, set amid beautiful gardens. 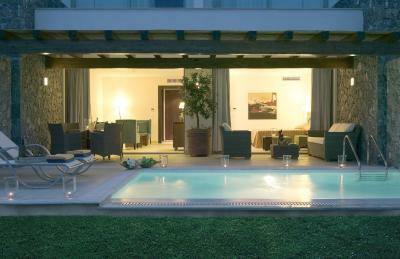 Each offers a balcony or terrace with view of the garden or the Ionian Sea. 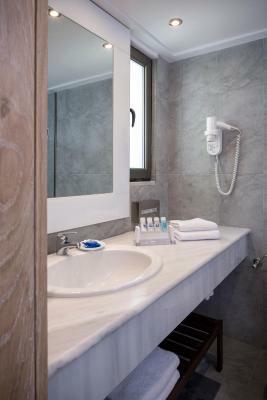 In-room facilities include air conditioning, a satellite, flat-screen TV and a hairdryer. A handy smartphone for free international calls and free internet mobile data is offered to guests for free. Dining options at Kontokali Bay include a beach-side restaurant, a beach tavern serving fish specialties and a buffet-style restaurant. The hotel also has a lobby/piano bar and a beach bar. The well equipped spa center offers an indoor heated pool, hammam, hot tub, 2 saunas and a steam room. 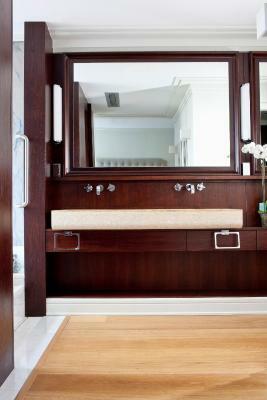 Massages, aromatherapy and anti-aging treatments are also available. Use of the spa facilities is free. A kids' pool is also available. 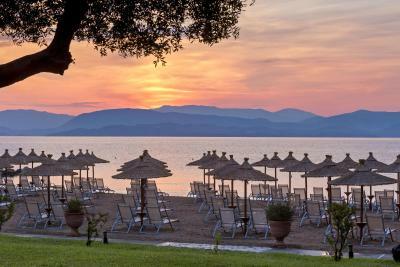 Kontokali Bay Resort is located just 3.7 mi from Corfu Town, Port and Airport. Staff can arrange various activities such as water skiing, horseback riding and mountain biking. Free parking is available nearby. 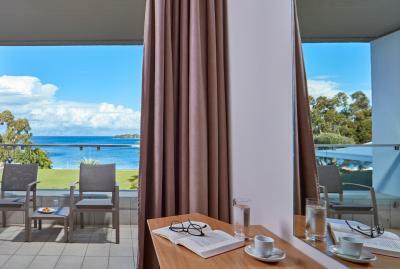 When would you like to stay at Kontokali Bay Resort & Spa? 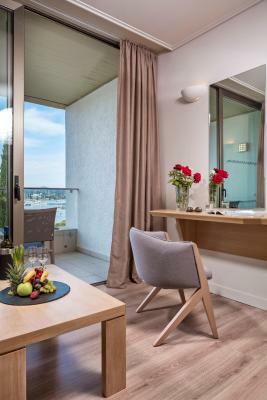 Opening to a furnished balcony with garden views, this double room offers a satellite, flat-screen TV, free WiFi, safe, coffee-and-tea-making facilities and air conditioning. 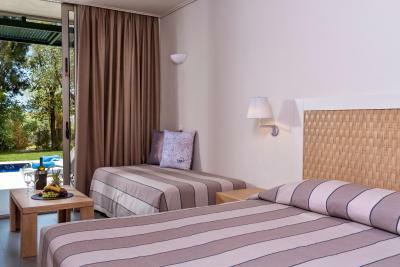 Opening to a furnished balcony with Ionian Sea views, this double room offers a satellite, flat-screen TV, free WiFi and air conditioning. 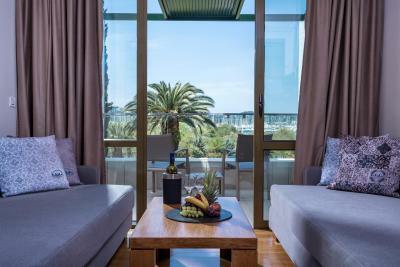 Opening to a furnished balcony with garden views, this room offers a satellite, flat-screen TV, free WiFi and air conditioning. 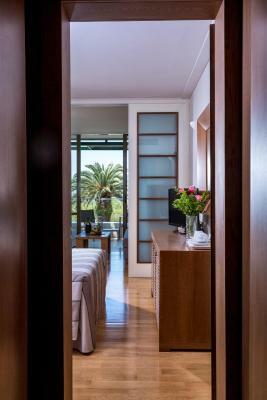 This room is ideal for family use, as they offer a separate bedroom and a sleeping area separated by a sliding door. 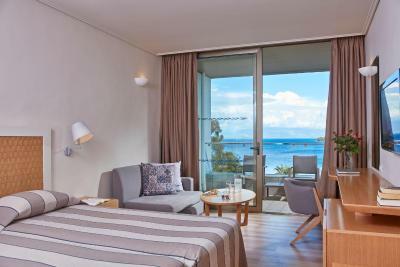 The Junior Suite is located in the gardens, with frontal sea view, overlooking the Ionian Sea and coastal mountains of the Greek mainland. 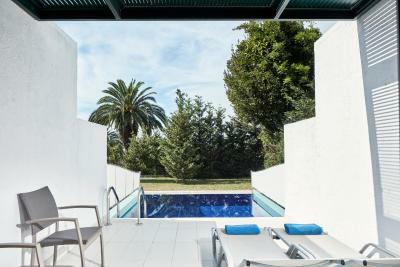 It features a private pool and terrace with sun loungers. Package is scheduled upon arrival and is valid for a minimum stay of 4 nights. Each adults is entitled to a weekly package which cannot be transferred to another person. Located on the main building, these rooms can be located on the second, third, fourth or fifth floor. 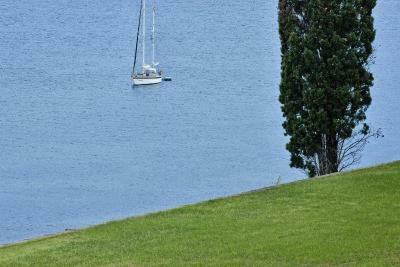 They overlook the Gouvia Marina and the green hills of Corfu. A free bottle of wine and a bottle of mineral water is offered upon arrival. 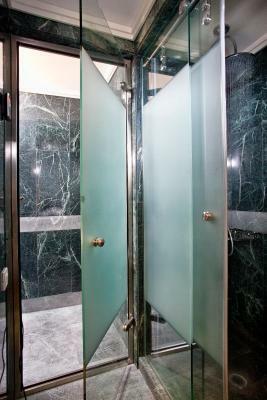 Located in the main building, these rooms are located on the ground floor, accessible via staircase. 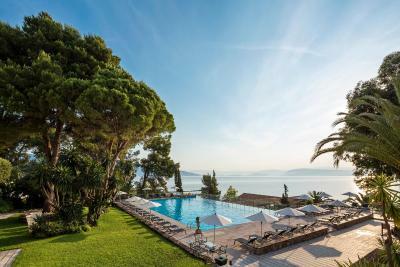 They overlook the beach and the Ionian Sea with the coastal mountains of the mainland on the background. A free bottle of wine and a bottle of mineral water is offered upon arrival, as well as a fruit basket. Daily evening turn down service is also available. 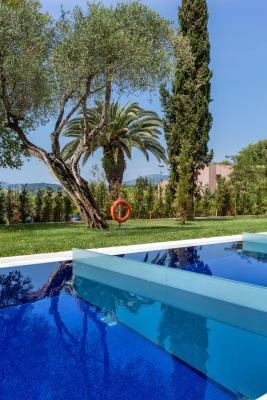 Overlooking Gouvia Marina and the green hills of Corfu from its private balcony, this family room is located on 4th floor and features a bedroom with double bed and a living room with 2 sofa beds separated by a sliding door. A flat-screen satellite TV, free WiFi and air conditioning are available. Please note that this room is accessible via a elevator and a small staircase. This room is set on the main building. 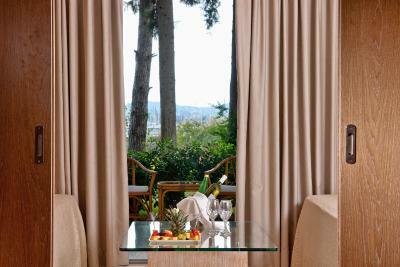 Upon arrival, guests are offered a complimentary bottle of wine, mineral water and fruit basket. 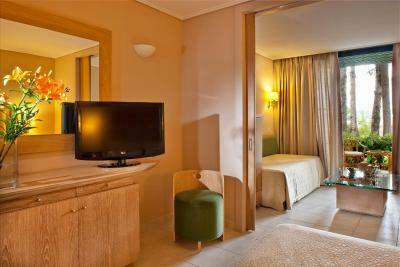 Located on the 1st floor, this room opens to a garden-view balcony. 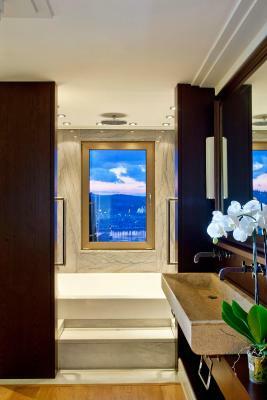 It includes a bathroom with bathtub or shower. 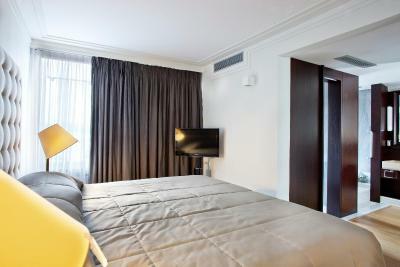 A flat-screen satellite TV, free WiFi and air conditioning are available. Located on the ground floor, this spacious family room opens to a furnished terrace providing direct access to the gardens and the playground. It includes a bathroom with a shower and a separate WC. A flat-screen satellite TV, free WiFi and air conditioning are available. 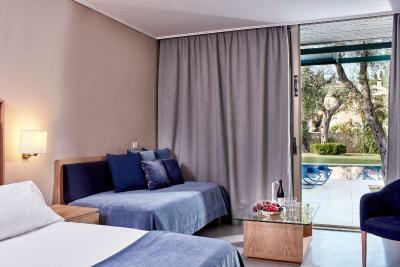 Overlooking the Ionian Sea and the beach from its private balcony, this room is located on the 1st or 2nd floor and is fitted with a double bed, a single bed, as well as an armchair. 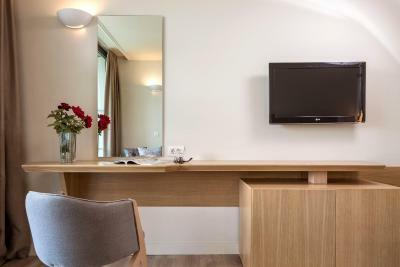 A flat-screen satellite TV, free WiFi and air conditioning are available. Located on the top floor of the main building, this suite opens to a decked terrace featuring a heated private pool with hydromassage jets and offering panoramic views to the Ionian Sea, the coastline, the fortress and Marina Gouvia. 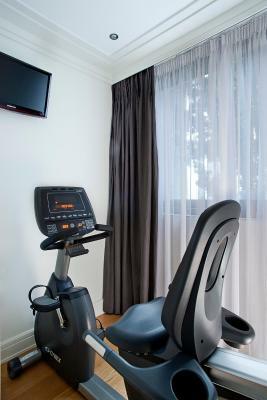 The suite also includes a hot tub, a hammam and a small gym with stationary bicycle. Featuring a private pool, this garden-view room is located on the ground floor and is fitted with a double bed, a single bed and an armchair. 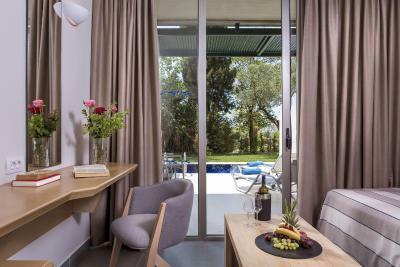 Offering unobstructed views over the Ionian Sea from its private balcony, this sea-front room is located on the 1st floor of the main building and has a modern bathroom with bathtub or shower. Boasting a private outdoor pool and a terrace with sun loungers, this double room offers views over the resort's lush gardens. 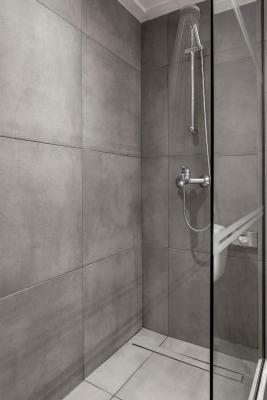 It is located on the ground floor of the main building and has a modern bathroom with bathtub or shower. A flat-screen satellite TV, free WiFi and air conditioning are available. 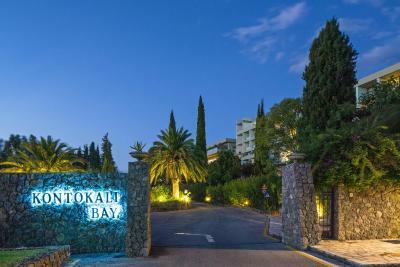 KONTOKALI BAY RESORT & SPA is a Hotel-Bungalow complex on the central eastern shoreline of the emerald Isle of Corfu, situated only 6 Kms from the island’s capital, Corfu Town (port and airport). The rooms and bungalows are set amidst beautiful gardens. 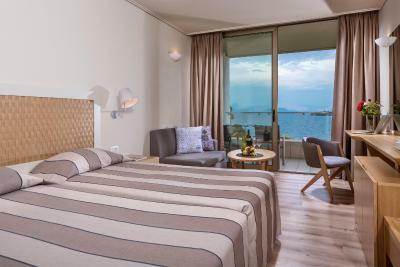 Each room has a balcony or terrace with view of the garden/bay or sea. 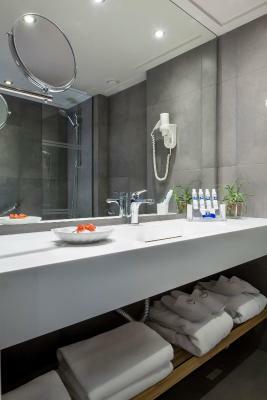 In-room facilities include air conditioning, a satellite LCD TV, mini bar, safe, bathroom amenities, bathrobes and slippers, and a hairdryer. 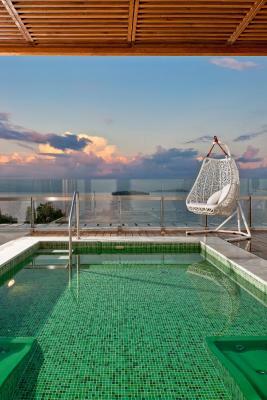 It boasts its own private 2 beaches (umbrellas and lounge chairs + towels free of charge). 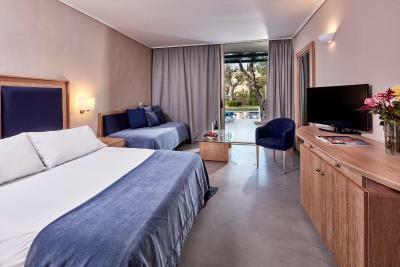 It features a floodlit tennis court, free Wi-Fi rooms + public areas and free parking. 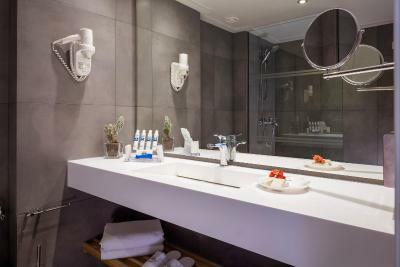 The well equipped spa centre offers an indoor heated pool, hammam, Jacuzzi, 2 saunas and a steam room. Massages, aromatherapy and anti-ageing treatments are also available. Use of the spa facilities is free. Dining options at Kontokali Bay include, 4 restaurants, a la Carte Restaurant, a Beach / Lounge Restaurant, a beach tavern serving fish specialties and a buffet-style restaurant. The resort also has a lobby/piano bar and a beach bar. 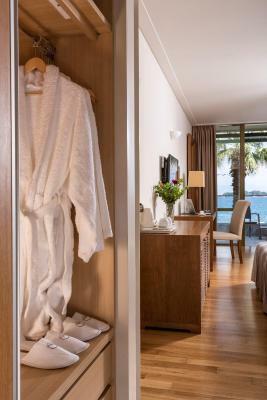 House Rules Kontokali Bay Resort & Spa takes special requests – add in the next step! Kontokali Bay Resort &amp; Spa accepts these cards and reserves the right to temporarily hold an amount prior to arrival. Kontokali Bay Resort & Spa accepts these cards and reserves the right to temporarily hold an amount prior to arrival. Guests benefit from spa packages at discounted rates including treatments such as massage with essential oils, color therapy and body peeling. Please note that guests under 16 years old are not allowed to the spa. Need another 1-2 toasters for breakfast. We liked everything. Will book for next year soon and this time with my parents too. 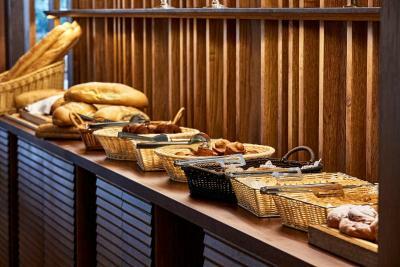 There could be more variety in the restaurants menu, lack of typical Greek food besides from Greek salad, squids, etc. Great staff - kind and helpful, the hotel itself was very clean, comfortable and well-maintained, beautiful gardens and beach. Coffee needs to be reviewed and on the negative side I would put the decorative bed covers that seemed a bit old. We had a standard room, which was large in size, clean and comfortable, suitable for two adults and our 1 and 3.5 year old sons. Location was very good, so close to the centre town, with lots of supermarkets near by. We tried the food in "Parea" restaurant and we ended up eating there most of the days that we spend in the island. The food was tasty, the atmosphere perfect and the staff were very polite and professional, congratulations! Having two kids under the age of 4, we also visited the Mini Club. Very nice place indeed, good sized kids swimming pool, very good play area, thank you Artemis for your kind attention :-) The whole place has a lot of seating areas, everyone can find a favourite spot to enjoy. Not to forget the live evening music events, so enjoyable and relaxed when having your drink! We think the bar prices are very expensive but guess that is to be expected in such a beautiful hotel. Everything was perfect , such lovely staff in the dining room, the bar, the lovely girls who did our room and especially receptionists, always so willing to answer questions. Beautifully refurbished spacious property with a variety of public areas. Good selection of places to eat and two lovely bars. Good Spa facilities with small gym. Room was comfortable and bathroom had great walk in shower. Beautiful view across the bay. Excellent sandy beach with bar service to your sunbed. Free shuttle bus everyday to Corfu town. Choice of evening entertainment was of a good standard. Everywhere was extremely clean and the staff were happy and helpful. Wonderful hotel. Fantastic staff, perfect location, great variety of food, beautiful beach! All was just perfect! Everything was great quality from the building, the food, to the staff, and how well we slept. Also great entertainment every evening.